What is the secret to a YES! Attitude? Doesn’t that evoke a feeling of YES!? YES! I’m going to take on this day or YES! I’m going to meet that goal! But that doesn’t come naturally to many of us. You have to work at getting and maintaining a YES! Attitude. I think the first thing that you have to do is to define what does a YES! Attitude mean to you? I define a positive attitude as the way you think about the way you think…you know what is interesting? That is also the definition of a negative attitude. But a YES! attitude is something more than that. 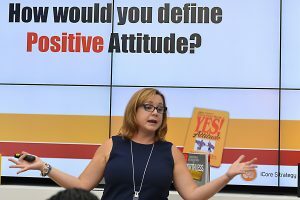 We all believe that a positive attitude affects advancement in our careers, or believe that it helps us be successful in our personal relationships. Do you believe that it helps us grow deeper in our spiritual relationships? Of course it does. How many of you have spent more than one day or one hour formally studying attitude? Isn’t it fascinating that one of the most impactful characteristics is something we have spent little to no time studying? I have four key suggestions for you if you really want to develop a YES! Attitude. First, you have to STUDY. Thankfully, there are a number of thought leaders out there you can follow, books you can read and listen to. I highly recommend The Little Gold Book of YES! Attitude by Jeffrey Gitomer. I even teach a course on YES! Attitude based on Jeffrey’s book. You have to invest time in taking your attitude to the next level. Frankly, I think I will study it for the rest of my life. Second, you have to THINK a YES! Attitude. You have to think YES! before every thought. You have to think YES! when you are working with the client you like the least, or YES! when you are dealing with a challenging child. You have to think YES! when you are resolving an issue with your spouse, your boss, or your co-worker. Sometimes you have to fake it until you make it and that’s okay. Change the way you think and eventually you will also change your actions. Third, you have to PICTURE YES! Sometimes you need to recall YES! moments you have already experienced in order to find your YES! attitude today. YES! when you crossed the finish line of the race you trained so hard for…YES! when you closed that deal you worked for months on…YES! when your child, grandchild, or godchild was first placed into your arms. You need to file these moments away so you can pull them out any time you need a little extra inspiration. Finally, you have to SAY YES! every single day. This is not a sprint, my friends, this is a marathon. And it’s a marathon for life. Study, Think, Picture and Say YES! everyday. That’s my secret to a YES! attitude.